We’ve had a great week on the Summer Woodsman course, starting with a heat wave but settling into cooler temperatures late in the week. We’ve spent a significant amount of energy working on axemanship, fire, campfire cooking, navigation, shelter, crafting, tracking and edible wild plants. Today is the last day of the course, and we’re looking forward to fire-by-friction, canoe poling in the river, finishing quickie bows and a bunch of other topics to round out the week. 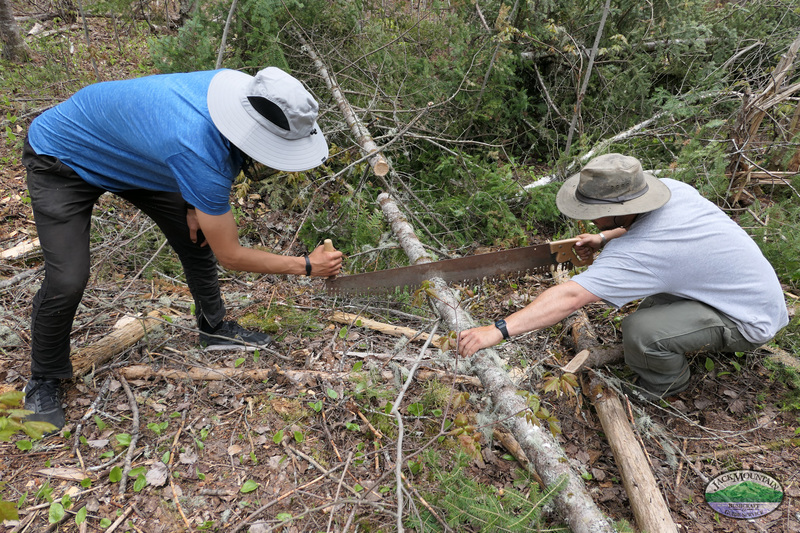 Our seasonal Woodsman course series is a great introduction to traditional wilderness living and guiding skills. We cover a lot of ground and expose participants to diverse topics, and have a lot of fun doing it. Thanks to everyone on this year’s course for making it a lot of fun. Quickie bow? Can you explain? Quickie bows refer to a field-expedient bow you can make in a few minutes. We make 2 minute bows and 2 hour bows on our courses.